Any woman wants bigger eyes – no matter how big they already are! That's because there is nothing more charming than awake, wide eyes. With a skilful use of makeup even small eyes can look big and focus all the attention! Learn the best makeup tricks to make your eyes appear bigger with our step by step guide. 1. eyebrows: should be neat and well defined. Pluck them slightly, clearing up the upper lid area, especially towards the outside and upwards, so they don't make your eyes smaller. 2. dark and puffy circles also shrink your eyes. Find the best shade of concealer for you ( a little fairer and warmer than your skin tone) cover up and blend. 3. they say every woman owns a lash curler...well, this is the time to use it! Apply a firm pressure and count till 10, repeat on the other eye. Curved eyelashes simply open up the eye and give it that doll look that no one can resist. 4. eyeshadow: choose a pale tint, possibly shimmery, to highlight the inside corners of your eyes for an instant wide awake look and added beauty. Also, apply the light eyeshadow under the brow bone for a face lift effect. Now, with a dark shade create a sideways V shape around the outer corners of your eyes- you can also stretch the point further with a blending brush. 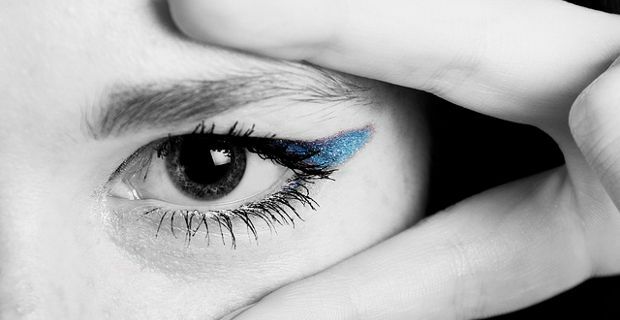 5. eyeliner: use a dark liner and apply it along your upper lash line. make as you get to the outer corner, and eventually extend the line even further. Also try colourful liners for a change! 6. mascara: choose a lengthening formula and apply it on both upper and lower lashes, then add volume to the top lashes with a thickening one, for an even flintier effect.